This November, round up your mates for the Mighty River Run for a boating adventure on the spectacular Murray River to support kids living with disability. The Mighty River Run is a five-day trip along the Murray River where you will be able to take in the spectacular sights of this magnificent river. There will be stops along the way in different towns and homesteads and each night will be spent in a different location in the stunning South Australian Riverland. Days and evenings are filled with entertainment and games that everyone can enjoy. Join our dedicated event Ambassadors, Channel 7’s John Riddell, Jason ‘Snowy’ Carter and football great, Russell Ebert and get ready to cruise for a cause when the state’s largest and longest floating fundraiser hits the Murray River for its thirteenth year. Novita provides child development, rehabilitation and disability services to young clients, as well as support for their families and carers. We support children and young people throughout their childhood and adolescent years, in Adelaide, regional South Australia and beyond. Our aim is to help all children and young people living with disability to enjoy every aspect of their lives – whether at home, at kindergarten, primary or high school, in the playground or on the sports field – and allow them to discover their full potential. Through our broader work with families and communities, Novita’s life-changing services have a direct impact on thousands of South Australians. In 2019, with your help, Novita will continue to invest in its expansion across the state so we can offer life-changing supports and services to even more families throughout South Australia and beyond. Building on the success of our established regional facilities, funds raised from the 2019 Mighty River Run will contribute towards purchasing specialised equipment for Novita’s new state-of-the-art head office and therapy hub in Hindmarsh, which is expected to be ready by mid-2020. Novita is committed to improving outcomes for our customers through advances in therapies, technologies and accessibility building design, and this exciting new hub, together with your generous support, will help to ensure Novita can provide improved services to more people living with disability in the community, when and where they need it most. Dan is a funny, cheeky and determined boy who lives with congenital muscular dystrophy and has been a Novita kid since just after his first birthday. 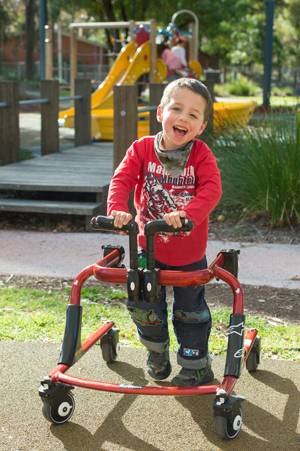 He receives physiotherapy, occupational therapy and speech pathology services from Novita and is also provided with various pieces of equipment that enable him to do things like walk and communicate. “This degree of independence and inclusion is a big deal to a little boy,” says Carol, Dan’s mum. Sophie is happy girl who lives with cerebral palsy, epilepsy, microcephaly, hearing loss in both ears, visual impairment and swallowing issues as a result of congenital cytomegalovirus. Novita provides Sophie with physiotherapy, speech pathology, occupational therapy services and equipment, as well as support for her family. “Without Novita, Sophie would not be where she is at today,” says Angela, Sophie’s mum. Chloe is a beautiful and determined girl who lives with cerebral palsy. When Chloe first started with Novita her mobility and speech was minimal. But gradually, Chloe built relationships with her therapists and was able to train her muscles to use a knife and fork, to walk and talk. “These are all fantastic improvements for Chloe, building her confidence, muscle strength and giving her new skills. And none of this would have been possible without Novita and the generous support of people like you,” says Tim, Chloe’s dad. Thanks to Club Marine as our major partner for the Mighty River Run. 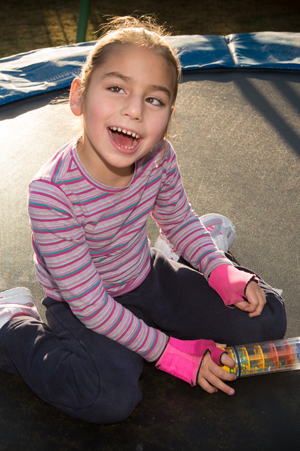 Club Marine is committed to helping support kids living with disability in South Australia.